Now that you’re not wasting money and water on bottled water, here’s a fun thing you can do with all those bottles. Make a Pop Bottle Drip Irrigation System for your plants! Drill 4-8 holes in the lid. Small holes for a slow drip. Not too small – you don’t want to get them blocked by debris. Cut the bottom of the bottle off, using the knife. Dig a hole near the plants you want to water. Bury 1/3 – 1/2 of the bottle in the hole with the cap in the dirt (open side up). 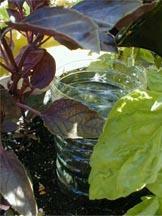 Now, pour water in it, and presto – an irrigation system for your plants. Even better – fill your bottle irrigation with rain barrel water! I have been doing something similar for ages, but I put the holes in the bottom of the bottle and retain the cap. That way you also utilize the condensation that gathers in the bottle rather than allowing it to evaporate. I once used this method on a 30 X 40 garden and it works great on a larger scale. Either way this method of irrigation gets the water right where it needs to be – the roots. If you fertilize or feed with liquid nutrients you can just put it in the bottle too, and be much more efficient in your use of plant food. Does this open bottle watering method create a problem with mosquitoes? Wouldn’t a screen over the open end be advisable if it takes a while for the water to be absorbed? That’s a great idea! Maybe reuse some old nylons, with a rubber band around the bottle to hold it on. Or, like Laura says above, drill holes in the bottom of the bottle, pour water through the neck, and put the cap back on.